What a great facebook shout-out from a client! Do yourself a favor and call Streamlined Living CO if you live in a small space where every inch needs to be utilized to its full potential! My husband and I recently moved to the Denver area and found ourselves living in a 700 square foot apartment. As we were moving in, we could tell that all of our things were not going to fit comfortably into our home. Luckily we found Meghan to help us organize our life! Meghan came to our house for a in home consultation to assess our living space and come up with organizational solutions for our small home. She spent an hour with us discussing different ideas for our space and measuring most of our apartment’s under-utilized corners and open areas. Within a few hours of leaving our house, Meghan sent us a extremely detailed and professional email containing several solutions/suggestions for thirteen different areas of our home that she thought we could utilize more effectively. These suggestions included space saving furniture, corner shelving possibilities, and solutions to hide the clutter in our entryway, pantry, etc. She even provided several different options with varying price points for each suggestion, which was extremely helpful! We ended up purchasing a variation of almost all of the solutions/suggestions that Meghan sent us, and have been extremely happy with our apartment’s transition from cluttered mess to functional and comfortable home!! I always thought I could do it myself – read every how to organize out there, had lists, had bins and baskets. 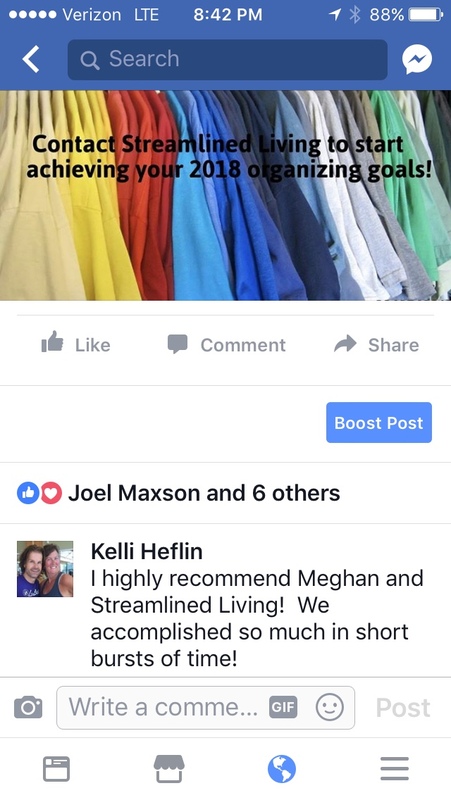 Hiring Meghan and Streamlined Living was transformational and her suggestions have had a profound impact on our ability to keep a house with three teens functioning optimally. After the first session, I knew Meghan was a gem and immediately purchased 9 hour blocks of time to tackle to-do lists that were decades old. Meghan is an accountability partner (we scheduled it, it happened), who comes overly prepared (need to hang that- here’s the command hook, need to tame those wires - here’s the Velcro wrap, need a different size bin – I have one! ), and who also whisks away the mess so you feel the magic of progress (let me drop that at the donation center and bring you a receipt, where’s your recycling?). She also has a keen design sensibility. Without purchasing any new furniture, we rearranged my common spaces to make them function as planned. We turned the ‘TV room’ into a ‘Living & Reading Room’ moving a bookshelf, arranging books (oh how she arranges books!) and space to read more. Immediately the teens are reading more in this space (magic!). We cleared my bedroom to make it a restful sanctuary – not sure how all the extra stuff piled up there to begin with – and she organized my jewelry in an item I had bought years prior (suddenly I can see all my nice necklaces, earrings and rings, upping my image as an unintended positive consequence). We set up functional organization in my laundry room so that household items make sense without cluttering the kitchen. Speaking of the kitchen – we cleared an ENTIRE DRAWER in moving things to a more efficient, functional set up (an ENTIRE DRAWER of found space). A message I received from a client after a recent session.